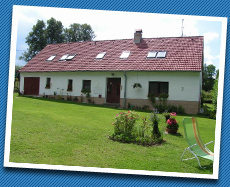 Our cottage and apartment which we offer for renting is situated in a village named Mostky, a small community near Kaplice. The history of the cottage reaches to the beginning of 20 th century. It has become our property in 1987. 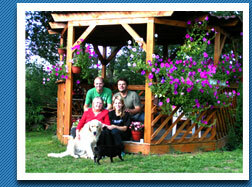 At first, the house served us for weekend leisure time and relaxation. That changed in 1994. From this time my mother lives in the house. Four years ago, after my mother has gone to pension, an idea was born to transform uninhabited garret into studio apartment, but the realisation itself begun in february 2007. So the next six months were very hectic for us, but the apartment is now fully finished. We will be pleased, if you arrive and rate the results of our efforts personally and we wish you to spend a wonderful holiday. We are prepared to do our best. We would like to create slightly different – more familiar relationship between the customer and the offerer. We are a family firm, so we create a family atmosphere. 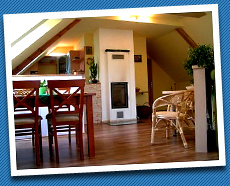 Our accommodation also creates a good starting point for exploring Český Krumlov with its surroundings, České Budějovice and surroundings, Novohradské mountains and Šumava. Distances for planning such trips are more than acceptable. You will surely appriciate as well that due to constant presence of my mother it will be possible to immediately solve any problem or suggestion. When you will compare our offer with others, don´t forget that we are offering you an above standart offer with very reasonable conditions with respect to offered equipment and apartment´s size (for further details see . „Informations about the apartment“).